Get ready to walk for good health when UC Walks on May 21 | Link: UCOP's e-newsletter | Stay Informed. Stay Connected. Lace up those walking shoes and head outside on Wednesday, May 21, for fresh air, fitness and an energizing walk with your colleagues. The fifth annual UC Walks marches into UC campuses this month, with 30-minute group walks, fitness assessments and wellness fairs at most locations. All the activities are aimed at promoting an active, healthy lifestyle and encouraging UC faculty, staff, retirees and students to carve out time in their busy schedules for regular exercise. 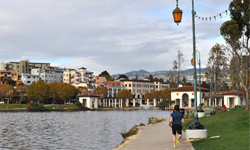 At UCOP, Retirement Administration Service Center (RASC) Customer Service Manager Michael Waldman will meet up with walkers at Snow Park at the corner of Harrison and 20th streets between 11:30 a.m. and 12:15 p.m. for a variety of activities and a 30-minute walk along Lake Merritt. More details will be announced in next week’s Link. >> Download event to my calendar. You can find out more about UC Walks activities at other locations by visiting the UC Living Well website. More than 5,480 people across the system participated in UC Walks last year, collectively covering nearly 10,700 miles. That’s about 2,000 more miles than in 2012, when walkers racked up 8,771 miles. 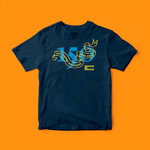 Participants in this year’s UC Walks will receive a free T-shirt, while supplies last. UC Walks is also a qualifying activity in the UC Living Well wellness program. Employees and retirees who participate in UC Walks will earn 2,500 points toward the 7,500 points needed to receive the $75 incentive gift card. You can also earn points by completing the online Total Health Profile and through other campus activities, online health programs and wellness coaching. Employees represented by some collective bargaining units are not eligible to participate in the UC Living Well wellness program and cannot earn the incentive gift card.